On a BBC politics, current affairs program, Question time last week had another of it’s heavily #brexit based episodes. This one featured UK Government and Conservative prig, William Rees-Mogg. Mogg is infamous for his lowkey, I’m holier than thou, silver spoon accent. He makes statements with such supposed authority you’d be hard pressed to doubt there were 12 commandments. This time in a pseudo-educated way, he prognosticated over William Churchill and took other members of the panel to task, “from the comfort of 2019”. “You’ve got to understand the history”. Turns out, as often, Moggs dictats were, as they frequently are, a mix of details and claims pulled literally out of thin air. Actual historian, Robert Saunders, took Moggs claims to task. First, some figures. From 1899 to 1902, roughly 48,000 people died in British concentration camps in South Africa. Of the 28,000 white deaths, 22,000 were children under the age of 16. More than 4,000 were women. The 20,000 Black deaths were less clearly recorded – a mark of official indifference – but most estimates suggest that about 80% were children. The Boer War makes a useful addition to my 2016, Making Britain Great Again post. There are plenty of people who think the current state of the UK economy is a cause for celebration. Lots of numbers up including employment. This belies the uncertainty ahead, and while the UK Pound continues to be at an effective 20% discount to the US Dollar, resources, people, products and services in the UK are effectively cheap. While this is likely to continue, those celebrating it as a result inside the UK should think again. In so much as individuals and business in the UK can acquire all the raw materials they need for manufacturing and business in the UK, it would be great. Sadly, apart from personal service, there are few to no products in the UK made entirely in the UK from UK Raw material. Exceptions are of course energy, oil, gas, wind, solar. Add to that nuclear power, and outside of the labor, technology requirements, the UK is expanding. Add to this government endorsed push for increased fracking, often overriding local wishes and you have one sector that is somewhat protected. The rest economy though, doesn’t look so good. Anything bought overseas, finished goods, imported food, and raw materials will increase in price overcome coming months and years until the cable(UKP/USD) resets to something like the $1.50 mark. FYI. Most futures contracts and supply contracts sources from overseas are priced in USD, even if they don’t involve US companies or US resources. So, what do the currency experts say? The following is the XE Market Analysis for December 30th 2016. Not so happy new year. Sterling has been trading with a heavy tone in the final week of 2016 trading, making a two-month low versus the dollar, a seven-week nadir against the euro and a one-month low versus the yen. The pound has now more than reversed the gains seen from early November, when the BoE adopted a neutral policy bias, through to early/mid December. The pound remains over 17% down versus the dollar since the Brexit vote in late June, and by some 12% in the case against the euro. BoE MPC member McCafferty last week warned that rising inflation and slowing global growth would hit the supply side of the economy in 2017, and there is a general view that UK growth will be sub-optimal over the next year as Brexit-related uncertainties drag on. Cable support is at 1.2200, while initial resistance is at 1.2297-1.2300, which encompasses the year-end holiday-season highs, ahead of 1.2344-50. We anticipate a return to levels around 1.2100. I wasn’t surprised to wake-up this morning to an email from my regular “hater” Rick. Back when I lived in Austin I’d regularly get anonymous letters, sometimes just pages from magazines with words highlighted to make messages. Much more often than that though, I’d get emails from Rick. As I’ve told you before, you should get off your high horse and stop blogging; you are just conflating two things to suit your own agenda, I just wish you’d go away, no one cares about your opinion. While the Iraq war might seem to have little to do with the BREXIT vote, it actually has everything to do with it. Last nights Panorama, where reporter Adrian Chiles goes home to the West Midlands to meet Leave voters. [Currently(Rick) you can watch it here and here on youtube, but neither are official and both likely to be taken down]. Listen for the causes for the justification to vote LEAVEs, lack of jobs, lack of school places, problems with Doctors and Medical, Pensions and more. All of those things have been hit by the austerity required to attempt to address the debt occurred from the British involvement in recents wars. Rather than discuss wars, the blame is squarely put on the EU and the open borders, thus the immigrants. Typical of the people interviewed is Tracy, she says she isn’t racist and that a few racist people are giving the leave voters a bad name. It’s got nothing to do with race, I mean, immigration is what makes the world go around, it’s not a bad thing, it’s a good thing. To me that’s how the world should work. I feel like this country is falling apart, I voted leave because I don’t feel like the government isn’t putting enough back into the community, our councils, our housing situation. We are helping everybody else yet we are forgetting here. For the record, I totally believe Tracy when she says she isn’t racist, but what she is confused about are the causes of her anger and frustration, and simplistic reasons for believing LEAVE will solve her problems. It isn’t that the immigrants have been taking what’s “theirs”, it’s that along with an overall decline, it’s that with the increased cost of war, the British Government cannot afford to invest to keep up with demand, and hence even maintaining levels of spending leads to austerity. As a follow-on from my post of yesterday, Blairs willful denial of the true cost of Iraq, I went to look for the cost to Britain of some of the recent wars and on defense spending. Wars in Iraq and Afghanistan were a ‘failure’ costing £29bn – This 2014 article in the Telegraph calls out £35bn of spending on wars. UK government spent 13 times more bombing Libya than on rebuilding post war – This 2015 article highlights the £320m spent on the UN Bombing campaign in Libya, initiated by Prime Minister David Cameron in 2011, which has failed to prevent Libya from sliding into chaos as feuding militias battle for control. 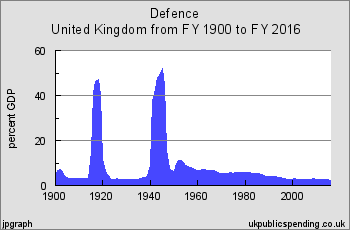 So while Britain now spends 3% annually of GDP on defence spending, and notionally the UK will now no longer have to pay and annual £12.9Bn to the EU, that is less than half defense and war spending. The UK though has the 3rd largest defence budget, larger than Russia, Germany, France, India and everyone except the USA and China. The British Pound has now fallen below the Argentinian Peso as the worst performing currency, and the consequences of this, plus the other financial issues, will mean that the LEAVE voters will have to get used to things getting worse with little outlook for them getting better. OK Rick? Watching former British Prime Minister Tony Blair speak in response to the Chilcot report, was depressing. Blair clearly hadn’t grasped, or at least wasn’t prepared to acknowledge the sheer cost in lives and money of going to war. Wars are expensive, very expensive. As of writing this morning, the UK/British Pound is worth $1.2989. Essentially an all time low. My prediction is that it will settle around $1.25. That is a staggering decline over the last 100-years from all time high of nearly $5. I’ve been sorting through my archives over the last 5-months, written, photographic and audio. I’ve even spent a few days building shelving to organize it, from scrap wood discarded by the local construction projects. I came across the WQXI Atlanta news piece last night, and it reminded of the first time I became aware of the exchange rate. I was only 10 years old at the time, but I can still recall to this day how serious the devaluation of the pound was at the time. The devaluation was done over the weekend and in a broadcast at the time, Prime Minister Harold Wilson said this, which I can still hear in my head and a phrase that came to Haunt Wilson. The Pound has declined in lockstep with the fall of the British Empire. The first major fall was post the failure of the classical Gold standard in 1914; when the cost of entering the World War meant the British had to assume massive debt. and as a result, devalued the pound. After the war was finished, Britain spent 10-years trying to return the pound to it’s prior value, using severe fiscal and monetary austerity. In 1925, Britain returned to the Gold Standard for a short time until 1931, post the great crash, when Britain again devalued the Pound. The Pound bounced back again shortly later in the 1930’s, but rather than being a strength of the pound, it was actually due to the weakness of the US Dollar following the 2nd FDR New Deal reflation. With the start of the Second World War, Britain again took on great debt; by 1944, that debt, combined with the debt from the First World which they’d never paid off, forced another devaluation and for Britain to join the Bretton Woods Exchange rate system which fixed the pound to the US Dollar, and the dollar was still linked to the Gold Standard. While the British could argue they’d defeated the Germans and ensured the freedom for all Europeans, it was at a massive cost that Britain has never recovered from. Politicians of the time tried, they’d set the exchange rate too high for a damaged economy. By 1949, they were again forced to devalue by 30% and the pound fell for the first time to sub $3. For the next 18-years Britain struggled, and the government had to go to the IMF more than once for help. The Pound was finally allowed to float freely against the US Dollar in 1979, but only after 1978’s winter of discontent. What followed for the next 30-years was increasingly futile efforts through the disastrous entry into the ERM, informally linking the Pound to the German Mark, and more, all to no real effect. Britain has consistently failed to recognize the real impact of the fall of British Empire, and the loss of the Pound as a reserve currency. Prior to World War 1, Britain, and by implication the pound was the dominant currency. It has gradually declined since then and while Britain still likes to think of itself as a global economy, but it really isn’t. When politicians like Andrea Leadsom, Former Economic Secretary to the Treasury and leading contender for next British Prime Minister, deny the financial impact of BREXIT, she clearly hasn’t learned the lessons of the past. Prime Minister Wilson’s government denied devaluation 27 times the same year they went on to devalue the pound. If Britain were in a fixed exchange rate system, BREXIT would have been another devaluation. The fall of the Pound since the BREXIT vote is the biggest since 1967 potentially. Welcome to the era of $1.25 and pray the Pound never falls below the mythical $1.00 rate. Making Britain great again… didn’t happen under Blair, won’t happen under Leadsom. *Footnote – This is of significant interest to me as I have an inheritance in the UK that I’d like to transfer to the US, and a former employer’s pension is both impacted by BREXIT and will be paid in UK Pounds, so it’s already worth less, and given the exchange, has probably halved in value this year.